IP Office helps bring together talented individuals to form exceptional teams – to collaborate faster, make smarter decisions and drive better business results. Being able to communicate anytime, on any device is critical today, and IP Office delivers what matters most: responsiveness, accessibility, and productivity—by taking collaboration to a whole new level. It’s all about uniting your collective strengths and delivering your collaborative best. ​IP Office cost-effectively grows with your business as it grows. Keep your original investment and simply build on it—for capacity or new capabilities. IP Office can go from basic telephony and sophisticated video conferencing to a wealth of mobility and call center applications. The system can be utilized by 5 users or 1,000. These users can be at a single site or at 32 networked locations. Pair IP Office with our own networking, security and video conferencing products for a proven approach to system reliability. Wherever you take your business, IP Office will go there with you. Avaya IP Office is a smart investment in every way, with a total cost of ownership that’s virtually impossible to beat. It is a feature-rich investment, supported by relentless innovation. An investment you can build on; easily add software to enhance and expand capabilities as you need them. Best of all, it’s an investment that’s proven to deliver exceptional returns. 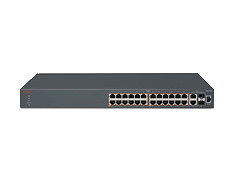 The Avaya Ethernet Routing Switch (ERS) 3500 is a series of high-performance compact Fast Ethernet and Gigabit Ethernet switches specifically designed for SME’s, branches and open environments outside of the wiring closet. 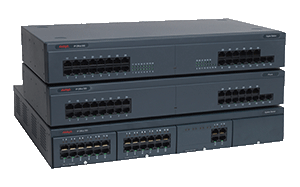 A low-cost, feature rich solution, the Avaya ERS 3500 series is comprised of six Ethernet switching products including 24-port Fast Ethernet model variants and 10 and 24-port Gigabit Ethernet model variants. Several models operate in fanless mode. And models which support IEEE 802.3af PoE and IEEE 802.3at PoE+ are available making this an extremely versatile product family. Suitable for SMEs looking for a reliable, cost-effective switch to provide converged services within single or multiple sites (typically with 100 users or less) and for midsize-to-large companies looking for a compact switch to provide connectivity within remote offices, the ERS 3500 delivers enterprise-class features at SME price points. This portfolio of products offer three models which can operate in fanless mode enabling quiet operation in noise sensitive environments such as class rooms and doctor’s offices, PoE and PoE+ capabilities are available ensuring investment protection for current and future end points. ERS 3500 also offers no compromises security and management functionality. The Avaya Stackable Chassis architecture will be available in the v5.1 software release. Automated set up with Avaya IP Office for seamless deployment of Avaya UC solutions—one simple command will automatically provision the switch to support an IP Office deployment enabling fast and error free deployments. Best in class network access and guest management with the ability to provision guest access in less than 10 seconds via integration with the Avaya Identity Engines portfolio. Avaya Inc. designs, builds and manages communication networks for more than one million businesses worldwide, including over 90 percent of the FORTUNE 500®. Focused on businesses large to small, Avaya is a world leader in secure and reliable Internet protocol telephone systems and communications software applications and services. Driving the convergence of voice and data communications with business applications - and distinguished by comprehensive worldwide services - Avaya helps customers leverage existing and new networks to achieve superior business results. For more information visit the Avaya Web site: http://www.avaya.com.